"The must have iCloud Drive App"
Share, Manage, Send, Open, Play, Listen, View, Create, Edit, Move, Rename, Import, Export your documents, videos, music, books and any other types of files on your Cloud Services. On your iPhone or iPad it all comes together now, many Clouds one App. 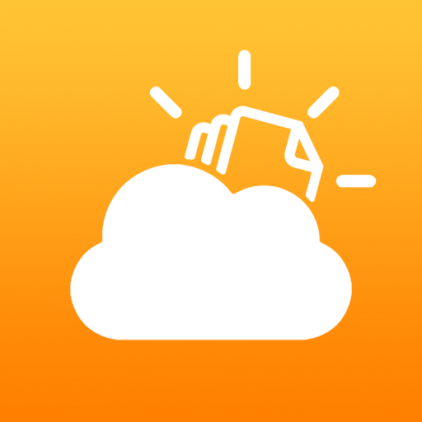 Cloud Opener allows you to Explore iCloud Drive and can open files from it. Opened files will be 'remembered' and shown in the file list. You can Edit and Save these files and they will be automatically uploaded/synchronized to iCloud. When from an other App these files are edited, the updates will be automatically downloaded. New files or copied files created in the Cloud Opener container can be opened by other Apps. From the OSX Finder or Windows Explorer you can also open and edit these files. Saved files will be updated automatically. Play Any kind of Movie..
Long Press is your friend! On a File to activate the Action Menu. On the Titlebar to call the Menu at any time. On the Titlebar in edit mode to Select-Deselect all documents. Great App by Darryl-H – Mar 22, 2017It does what it said it would with ease. I open send any receive all my files as if they were on my device. Great program by Terrhian – Mar 6, 2017I dont know why others are having problems. My guess is operator error. It lets you access files in the iCloud Drive without any issues. You may need to have a basic understanding of file management to understand how it works. Also usual brilliant customer service! Finally a great and pure non-chinese file manager, Appstore is full of chinese apps these days specially the file managers but this one is acceptable :) hope to see Persian language later. I've grown so sick of seeing apps that feature all the cloud storage in the world except iCloud, where all our documents are located and backed up. This is an extremely useful app by working with iCloud enabling you to work with your files. Also included are an import action button if you want to import documents from google drive, one drive, and box--if memory serves me correctly. You can also export documents by opening them in different applications. Having all these features in one place was a great idea. PDF Expert 5 is also included for importing and exporting files. You can preview documents within the app, you can save documents in a section called Local. This app makes it easy to use your iCloud as well as any storage apps you might have and not Dropbox or WebDAV or handed or any other app that's making me sick to see. This app supports iCloud, Google drive, box--all the right storage apps. It's a great app and you won't regret buying it. Who can afford Dropbox? Apple is practically giving away a tg of space for twenty dollars. What's not to like? Google drive is similarly inexpensive, as is box. Working with this app has made my work more efficient than it was before. And there are many more features that I haven't mentioned that make the app as worthwhile as it is. It does all the things the iCloud app should do and doesn't. I wonder how I managed without it. Thanks!!! This app gave me the one feature I still needed my Mac for on a daily basis: moving a file iCloud from an app folder to another folder outside the app folder! Works like a charm. Just read the FAQ on the developer's website and you'll be fine. Haven't plaid with any other feature, as I have my preferred apps for everything else, but this solved the file move problem and appears to be the only app that can do so. Thank you for giving us this app! If you like Cloud Opener, please have a moment to leave a great review in the App Store. I really appreciate it! If you encounter any problems, please let me know and I will help you out. If you encounter any problems, please let me know. Save new images in the selected (JPG or PNG) format. Keep same JPEG compression ration when saving existing edited images (except resize). PDF reader has no display sleep anymore. Music player now plays in background. Send from another App "Copy to Cloud Opener", local storage file list updated when opened. Send from another App "Copy to Cloud Opener", action as configured like App usage. Open WebArchive no longer complains when there is no internet connection. Open a Webarchive, webloc or .url file. Previously opened Documents will be remembered and shown in the Cloud Opener table for quick access. Images or Photos with a powerful Image Editor. Enhance, Resize, Copy, Paste (Also from Pasteboard), Draw, Stickers, Text, Filter and many more. Font, Style, Size, Alignment, Color and many more. Importing will make a copy of your Document and stores it on your device. Support for any type of document depends on the installed Apps. YES, files need to be downloaded to your device by iOS before they can be used. This is true for all Files from iCloud with any App. NO, Cloud Opener is not making copies of your files. The downloads are NOT stored into Cloud Opener but in the iCloud Cache of iOS which is managed by Apple. ANY APP THAT USES iCLOUD DRIVE DOCUMENTS NEEDS TO TRIGGER DOWNLOADING FILES BY IOS BEFORE THEY CAN USE THOSE FILES. The iCloud Deamon of the iOS is downloading the files from iCloud Drive and caching them for use by any iCloud enabled App. When Cloud Opener accesses an File from iCloud Drive, it has to wait till downloading by the Deamon is finished otherwise Cloud Opener (or any other App) can use the file. Cloud Opener shows you recently opened files in a list view together with files that are stored in the Cloud Opener iCloud Container. This Container is also accessible from the OSX Finder and (when iCloud is installed) from the Windows Explorer. Files copied to this container will be automatically arrive at your iDevice and visible in the iCloud Drive list. Files created or copied by Cloud Opener will be automatically uploaded and come available in the Finder or Windows Explorer iCloud Drive container. Besides the iCloud Drive list view, Cloud Opener also supports Local file storage. Files can be created, moved copied etc. between the Local Storage and iCloud Drive. Just drag some files from the Finder into the Cloud Opener folder and you will see these files arriving into Cloud Opener. The iCloud Drive Browser is a by Apple developed and restricted component. The inner workings are controlled by iOS not by Cloud Opener. If Cloud Opener does not show the files no other App will be able to show the files. It is not allowed by Apple that AppStore Apps use this browser as the main view of the App! Rejection is the result if so. There is also the Import function. This function does make a copy of the file and stores it into the at that moment selected directory (Local or iCloud). Create a 3D model of your own car! Use your model as a toy or as an in-Car entertainment compass.